I did not get to go fishing as much as I wanted to lately, and a recent winter flounder trip that despite amazing weather resulted in only one keeper fish is not a highlight of my fishing career. 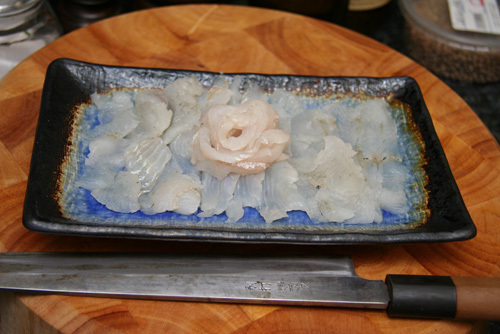 But the flounder sashimi that I made out of it was absolutely awesome. 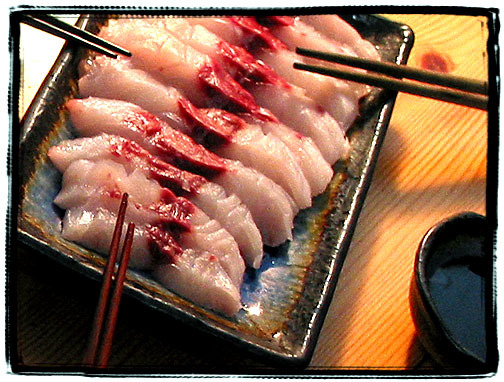 Here’s a picture of striped bass sashimi that I made a few years back. I’m told that the dark brown (looks red in the picture for some reason) meat should be removed from fillets. It was very tasty anyway. Food safety is not something to be taken lightly, of course. A lot of people gasp – homemade sashimi? That’s suicide! But if you ask me, food police, fear of lawsuits and American germophobia goes a little too far. Over the years I ate a lot of potentially deadly stuff. Street vendor food, for example. Did you ever wonder how those guys go to the bathroom? Cafeteria food. Oh, and not only American street vendor food and cafeteria food. Soviet too. I ate a lot of sushi and sashimi. I’ve had raw Korean beef. A lot of oysters, some rare steaks (usually I order medium-rare). In Ukraine I liked to snack on raw chicken eggs. I ate fish that I caught in the uber-polluted Black Sea. I even ate raw mussels (and they concentrate all the bad sea crap) there. And you know what? While long term health effects of my omnivorous eating are not known yet, I had a very mild case of food poisoning only once. From a reportedly unexpired can of Alaskan salmon. I am scared myself. Food here for the most part does not taste right. The large scale growing and processing does something to it. I highly suspect that it’s one of the major contributing factors in the obesity epidemic. In any case, I remember watching Anthony Bourdain’s “No Reservations” where he sat in a French bistro and pointed out half a dozen things that would be completely illegal in an American restaurant, but actually make a eating in that bistro amazing. As far as homemade sashimi is concerned, I hear a lot of talk about freezing fish overnight in a freezer to kill parasites before eating it. I’ve tried this, and it makes the texture of the fish mushy. I am not sure about this, but it seems to me that the only fish that gets that treatment is tuna – I’ve seen huge frozen carcasses in the Tsukiji fish market. In any case, raw fish that I caught myself if probably the freshest that it can be. The only way this sashimi could be any fresher is if I cut and eat the still alive fish right on the boat.